Since opening in 1969, KPC’s attitude to custom design has always been to give the customer exactly what they want. Continuing with this principle for the last 45+ years has meant that we have managed to build up what we believe to be the widest range of standard and off-standard precast concrete wall coping available on the UK market. Delivery direct to site takes as little as 48 hours. Fast shipping of precast concrete Wall Coping to any UK Postcode! Precast concrete wall coping and cast stone copings provide a cost effective way to finish off any style of wall in an aesthetically pleasing manner. They play a protective role in preventing staining and erosion to the face of the wall which could otherwise be caused by rain and frost. Proper installation of Precast Concrete Wall Coping stones also helps to prevent moisture ingress in cavity walls. Precast Concrete Wall Coping is a core product for us, and our technical team are regarded by our customers as specialists in this area of construction. If you cannot find exactly what you need, ask us about manufacturing a special. 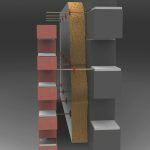 KPC normally recommends that wall coping overhangs both faces of the wall by up to 75mm, depending on the wall’s function, thickness and materials used. For this reason the width of the precast concrete wall coping stone is the most important dimension. Precast Concrete Wall Coping can finish flush with the surface of the wall in certain circumstances. Copings of this type generally do not feature a water drip, whereas most others do. When ordering, care should be taken to confirm the specification of this critical design element with our technical team. Our wall caps are available in plain concrete, cast limestone and cast sandstone. Cast stone provides the designer with a wide colour palette and range of surface treatments to work from. Design advice is available on request. KPC recommends you refer to BS 5642:Part 2 and Eurocode 6 for technical design guidance. Need something bespoke? We can modify our standard off-the-shelf designs to suit your specific requirements and deliver to anywhere in the UK. ONCE WEATHERED WALL COPINGS are so called because they shed surface water in one direction only. Applications include parapet walls where water needs to be directed inwards towards a balcony or flat roof for drainage purposes. Specifying once weathered precast concrete wall coping provides the greatest number of design options, especially when it comes to specialist corner units, both internal and external. TWICE WEATHERED WALL COPINGS shed surface water in both directions and are commonly used on boundary walls, in conjunction with pillar caps. Specialist internal and external corner units are less common with this type of coping. Download sizing chart for Once and Twice Weathered Precast Concrete Wall Coping here. TABLING WALL COPINGS are popular in modern construction because their flat tops complement a minimalist aesthetic. Tabling coping is versatile, because internal and external corner units are the same. They are ideal for use where railings are required to be fixed on top and their function can double as a bench when used to cap low walls. CHAMFERED WALL COPINGS can be used for a wide range of standard and off standard of design applications, but are very often used to match Victorian style deep coping stones in heritage areas. Their flat tops provide an ideal surface for fixing steel railings. ROUND TOP and other unusual designs are used for a myriad of design applications. KPC carries a standard range of these round topped precast concrete wall copings and customers are advised to contact our technical department for drawings and advice. Download sizing chart for Chamfered, Round and Tabling Precast Concrete Wall Coping here. At KPC-UK we manufacture a type of vandal proof wall coping that responds specifically to customers issues with vandals unseating wall coping and knocking it over. This particular wall cap model is designed to suit walls with a rendered finish. Our anti-vandal wall coping features an integrated expanded metal mesh which is laid flat against the wall face before rendering and the render coat is applied over the mesh. This will give a surprisingly strong bond between the wall cap and wall and will make it very difficult to unseat the wall caps. This has proven to be very successful in responding to the needs of customers that had experienced wall coping being unseated by vandals. KPC offer a range of Tactile Studs and Tactile Strips for use as anti-slip aids and particularly as aids for the visually impaired. 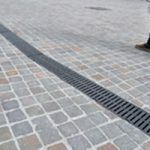 Manufactured from high grade (marine grade) stainless steel and available in a variety of finishes, these tactile studs and strips allow quick and easy conversion of existing standard paving to Tactile Paving. 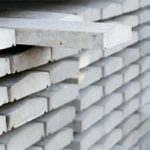 KPC manufacture a very wide range of wall caps, also known as wall coping. Our range includes a variety of off-the-shelf styles and sizes at a very cost effective price. Our designs can be modified to suit specific requirements and applications.